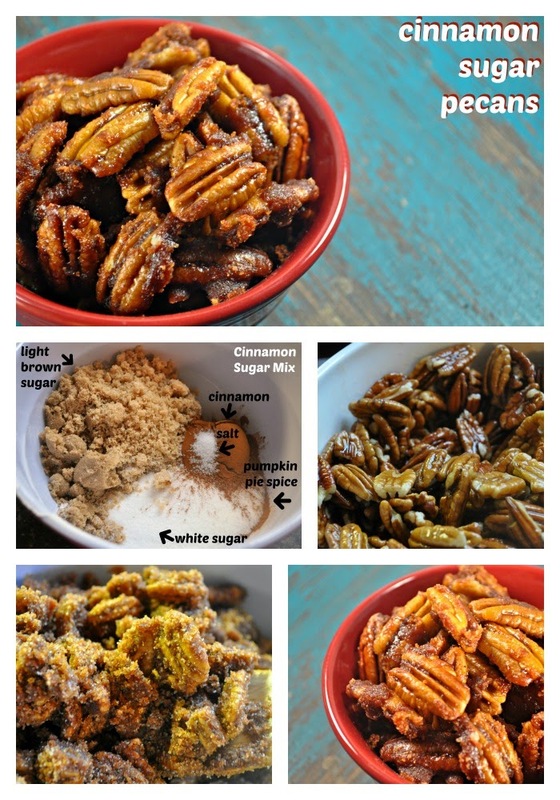 Recipe: Slow Cooker Cinnamon Sugar Pecans | The Food Hussy! Today I get to share with you one of my favorite foods that I have "discovered" as an adult - sugared pecans!!! My husband and I love these- whenever we see them - we get them! Flea markets, the zoo, festivals, whatever, whenever. He likes the almonds - while I like pecans. I've seen the recipes for making these for quite a while and then I got some pecans in the mail from Klout - so I thought - here's my chance! Let's make them at home and not have to buy them ($6 for like 12 nuts - ridiculous!). It's not too hard actually - and there's a slow cooker involved - first you mix all your sugar & spices together. White sugar, brown sugar, cinnamon, salt and pumpkin pie spice - stir stir stir. I needed something to stir this all up with and my mom got me this Spurtle set for Christmas. I had never heard of a Spurtle but turns out it's a Scottish kitchen tool that is a wooden spatula. I have to say - it was perfection for this task! The natural curve was perfect for scooping and stirring the nuts into the sugar mix. Love it! So after the nuts are coated with butter then you stir them in the sugar mixture. I probably had a little more of the sugar mixture than I needed - but hey - that's not a bad thing right? After you stir stir stir - pop in the slow cooker for 3 hours - keep stirring every 30 minutes or so. The recipe I used said to add in 1/4 cup of water in the last 30 minutes. I don't think I would do this again - it really made the mixture far too sticky. I think maybe spraying them with water - just to make the sugar mixture stick a little more - but not 1/4 cup. Even thought they were a bit sticky - it looked marvelous!! Come on - you know you want a bite! Once on the parchment - spread them apart as best you can and let them cool. I put mine in the oven because it's the one place the dogs can't get to! My big dog is skilled at getting things off the counter. These were DELICIOUS! I took some to work in a small container - my husband took the big container to work. It came home EMPTY. Needless to say - I'm making these again very soon. Mix together in a large bowl sugars, cinnamon, pumpkin pie spice and salt. In another bowl with a whisk, mix together butter and vanilla. Add the pecans and coat thoroughly. This will help the mixture stick to the pecans during the cooking process. Add the pecans to the cinnamon sugar mix and toss well so all the pecans are coated. If there's any extra butter pour in as well. Stir your slow cooker (or liner) with non-stick spray. Once the pecans are coated with the cinnamon sugar mix add them to the slow cooker. Cook on low for 3-4 hours. Stirring every 20 minutes. In the very last hour, add ¼ cup water and stir well. This will ensure a crunchy coating and help the mixture to harden. Line a baking sheet with parchment paper and spread the pecans onto the sheet to cool. The pecans should be pretty sticky so be sure to separate them the best that you can and let them cool. Recipe inspired by Pip & Ebby and the Recipe Critic.